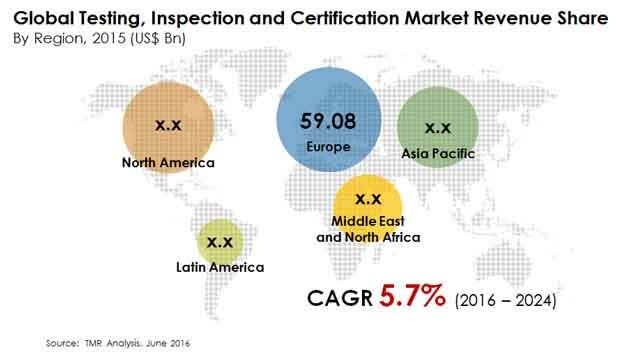 Leading players in the global testing, inspection, and certification (TIC) market are adopting different competitive strategies to strengthen their position in this highly fragmented arena. These include research and development, service development, and mergers and acquisitions, finds Transparency Market Research (TMR) in a new study. Bureau Veritas SA, SGS Group, Intertek Group PLC, and Dekra SE are the top four companies in the market, accounting for nearly 29% of the overall market value. The global TIC market stood at US$220.11 bn and is poised to expand at a CAGR of 5.5% between 2016 and 2024, reaching a value of US$345.96 bn by 2024. On the basis of application, the oil and gas segment will continue to dominate the market until 2024, representing 20.91% of the overall market revenue. However, the telecommunication segment is expected to rise at a noteworthy CAGR during the same period. Due to the evolving state of competitive pressures, ongoing technological advancements, and ever changing regulatory environment, telecommunication equipment manufacturers are increasingly opting for inspection and testing services. North America and Europe are, collectively, expected to command a large share in the global TIC market by revenue throughout the forecast period. The growth of these regions can be attributed to the increasing awareness among consumers regarding the benefits of consuming certified products. Moreover, the presence of efficient regulatory bodies responsible for protecting and promoting public health through the regulation and supervision of food and other consumer goods is contributing to the growth of these regions. However, Asia Pacific is anticipated to rise at a significant CAGR of 6.1% during the forecast period. The rapidly growing food and beverages industry and rising number of affluent consumers are fuelling the growth of this region. In recent years, regulations pertaining to quality, health, and environment safety have become increasingly strict. Adherence to international TIC has become imperative for manufacturers as it boosts the acceptability of their product. Moreover, globalization has led to increasing trade across the world. Developed countries often import food and other products from developing countries. Imports from developing countries are required to pass stringent tests in order to conform to the international standards. Furthermore, high cost to run in-house laboratories is impelling companies to outsource their testing, inspection, and certification activities. These factors, collectively, are anticipated to have a sizeable impact on the growth of the global TIC market over the forecast period. Lack of internationally accepted standards is a hampering the growth of the global TIC market. Meeting the international standards often results in increased costs as it might necessitate a tweak or change in the design of a particular product or service. Different countries have their own different set of standards, which makes it very challenging for manufacturers to develop a single type of product. However, developing countries are offering immense potential for the growth of the testing, inspection, and certification market. In the recent past, there has been a drastic rise in the volume of goods being exported from developing countries to developed countries. Moreover, the improving economic conditions and rising disposable income is boosting the demand for consumer goods in emerging economies.